The combs are usually soaked in camellia oil to keep their shine for many years. They also prevent static electricity to develop. Japanese boxwood comb does not create static helping make all hair look beautiful. Dragon design and more, click the thumbnail. A Japanese comb is about much more than just styling your hair. Some 400 years ago, Japan took the simple comb and transformed it into an elegant beauty accessory that became a work of art. 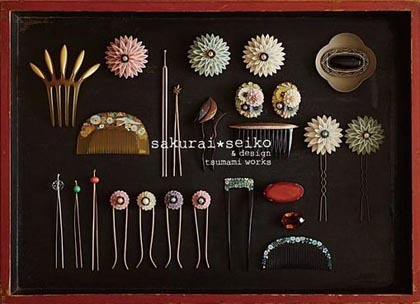 Japanese kushi (combs) and kanzashi (hairpins) became expressions of a woman’s character, social class, religion, and people could even tell what neighbourhood someone lived in by looking at their hair ornaments . 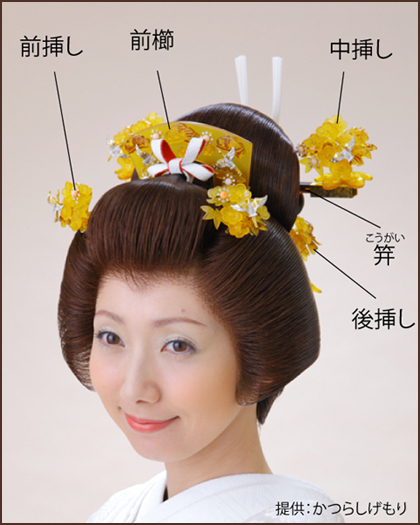 According to an ancient Japanese proverb, “A woman’s hair is her life” (Kami wa onna no inochi) and from the early 1600’s until the beginning of the modern era, decorative combs and hairpins called kanzashi have been an important part of Japanese fashion. Western style jewelry such as rings, necklaces and bracelets was not worn in Japan until the modern era. Instead, women decorated their hair. The elaborate hairstyles (mage), of the Edo period required a tremendous amount of time and money to maintain, and the value of what a woman wore in her hair often far exceeded even the cost of the beautiful silken, gold brocade kimono she wore on her back. Hair was so important that it came to symbolize nearly every facet of her existence. Looking at a woman’s hairstyle, you could tell what social class she belonged to, whether she was married or not, her age, and whether she had any children. Hair ornaments became important family heirlooms that were handed down from generation to generation, and in Kyoto, when a comb eventually wore out or was broken, it was saved until the Kompira Kushi Matsuri (Kyoto Comb Festival) and taken to a temple where prayers were said for its spirit, after which it was burned in a purifying ritual fire. As lovely as Japanese combs are, however, they are almost never given as gifts because of a superstition that associates them with suffering and death. The word kushi, is associated with misfortune because it sounds like the words for suffering (ku) and death (shi). One should never give one as a present because it might bring death to the person and, similarly, it is considered unlucky to pick one another person’s comb because you may take on a person’s suffering. Although decorative combs went out of fashion for the general public more than a hundred years ago, they are still worn with kimono, and if you know where to look, it is still possible to find craftsmen that make and sell them today. One such shop is Nijusan-ya (Jusanya), a tiny store hidden in plain sight in Kyoto’s bustling Shijo shopping district. Nijyusan-ya means twenty three, a seemingly strange choice of name for a comb shop, and is puzzling even to Japanese people who aren’t in on the joke. It comes from a Japanese word for the special bamboo combs that are their specialty, called togushi. The characters used to write togushi have the same pronunciation as the numbers ten (to), nine (ku or gu) and four (shi). Add them up and you get the shop’s name, twenty three. Nijusan-ya is very Kyoto. In typical Kyoto style, it does not advertise, has a tiny sign, and is the kind of place you could walk by 500 times without ever noticing. In business for more than 180 years, it has been at its present location in Kyoto’s downtown Shijo district for more than 60. They sell nothing but combs and hair ornaments, but their goods are of such high quality that they are able to compete with the cell-phone shops and trendy designer clothing boutiques nearby. Kyoto has always been known for the quality of its gold, tortoise shell, mother of pearl, and lacquer work, and Kyogushi (Kyoto-style combs) are the most famous in the country. Kyoto’s combs have traditionally been made from boxwood from the island of Kyushu, which has become extremely rare and expensive. While other comb makers have resorted to importing low-priced boxwood from Thailand, Nijusan-ya insists on using only the domestic variety to ensure the quality of its products. That is the secret to Nijusan-ya’s success. The owner, Isamu Kakie, like his father and his grandfather before him, is uncompromising in his adherence to tradition. 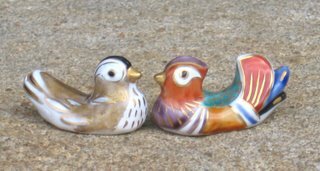 Every last item in the shop is hand-crafted by skilled artisans who shape the wood by hand, and then spend hours or days decorating the products with the beautiful cranes, Mt. Fujis, chrysanthemums and cherry blossoms that make them so gorgeous. Hair ornaments could even be a deadly weapon. Female ninja called kunoishi used them to rake the eyes of their victims while escaping or dipped them in poison to assassinate people. There are also many accounts of women using them to fend off male attackers. the word for comb is kushi, and it can also mean KU nine and SHI four, which add up to be 13, or 十三. ... was known to the whole country as a special product of Nakasendo and a souvenir of the Ontakesan belief and the Zenkoji Temple visiting since Edo period. Still, this Yabuhara-juku makes and keeps being loved as a traditional craft goods of the comb and Nagano Prefecture of utility goods. The Nagano Prefecture Kiso-gun Kiso-mura is given to a rich forest and the head of a river in the village of the source of Kisogawa and has developed. Yabuhara-juku located in the south of "Torii pass" called the most dangerous place of the Nakasendo was a stage of "Center point of Nakasendo" in Edo period,and the transportation node as divergence in the point of east and west and the Hida Road. "Orokugushi" is told to have come to be made from the Yabuhara-juku, year of the Kyouho era of Edo period. There was a beautiful maiden name of "Oroku" in the Tsumago-jyuku. She was always worried about sickness of the head. Oroku prayed to the Ontake-Daigongen as a certain traveler had taught one day. There was reporting..."Comb the hair with the hatchel made from the Minebali tree in the morning and evening. Your headache recovers without fail. " Oroku immediately made the comb of the Minebali,and she combed the hair every evening every morning.Then, her sickness was put away completely soon on several. 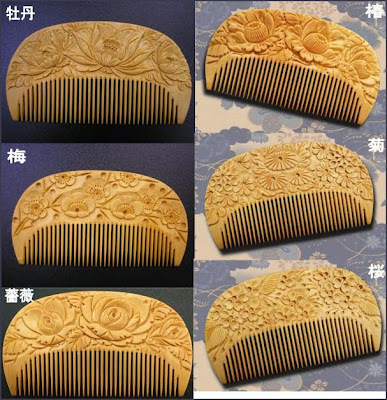 This was, and when the comb made from Minebali that was able to be taken in the vicinity was marketed to the traveler, "Oroku-gushi" became serious famous, and it was well known to the whole country. It is said that it came to make Orokugushi also in the Yabuhara because the Minebali that is the material tree can be gathered near the Torii pass when becoming year of the Kyouho era. The article on Orokugushi is in Edo period is published in the book on Ota Shokusanjin's 'Jinjyutsu Kikou' (1802). Orokugushi made the name known to the whole country in addition by the play of the original of Snto Kyoden 'Orokugushi Kiso no Adauchi' in 1807, and became a large fashion. The thing that the house of 78 percent in the Yabuhara-jyuku was involved in the work of the comb is understood according to material in 1844 - 1848. It is assumed that about one million combs were produced in the thicket field according to the record in 1876. The comb made here is called to be "Orokugushi" generically in Yabuhara-jyuku. As for the kind of Orokugushi, a lot of various names are given by shape, the size, and the difference of how etc. to apply teeth. so I could meet many ladies". The final step in the production process is natural drying after soaking in camellia oil.
. 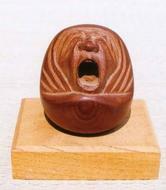 Regional Folk Art from Japan - Kagoshima .
. Oita Folk Art - 大分県 Ōita . Tsuge combs from Beppu　別府 . The only man among Kyoto's last five keppatsu-shi, or hairdressers to the geisha, Ishihara is the coiffeur king of the most celebrated of the pleasure quarters surviving from old Japan. くし・かんざし・化粧具 : 江戶の巧芸 : サントリ一美術館コレクション. Kyoto biyou bunka club (Kyoto cosmetics culture club) started it at 1961.
on the 4th Monday of September. Because one pronunciation in Japanese of 9-gatsu (September) is “ku-gatsu” and 4 is “shi”, the word that strung two words together becomes “Kushi” which means a comb. 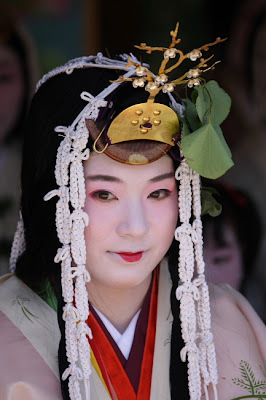 The highlight of the festival is a procession of women who are doing up own hair to various Japanese coiffures, and wearing various kimonos, and making own faces up.
. Edo shokunin 江戸の職人 Edo craftsmen . They made decorative combs for the ladies to beautify their coiffure. Since the ladies did not wash their hair as often as it is done now, they had to make use of comps regularly. The wood for a comb was mostly tsuge 楊 boxwood, but shitan 紫檀 red sandalwood, kokutan 黒檀　Ebony Diospyros and other light wood was also used. The wood was cut into a rough form and then let sit to dry for three or more years. Ivory, bekkoo 鼈甲 Bekko tortoiseshell, horn of deer and even bamboo were also used. CLICK for more illustrations !
. . . . . The resulting unique scrapbook features over 500 charcoal rubbings of miniature Japanese combs and hairpins (koagi). . . . . .
. . . . . 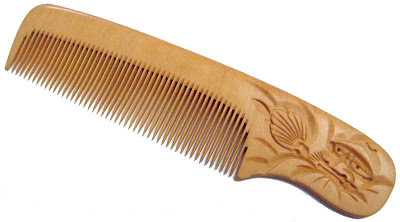 Traditional comb shapes are half moon, horseshoe, and square. The combs were often worn in concert with koagi (hair pins) in classical Japanese hairdressing. . . . . .
. bihatsu kigan 美髪祈願 praying for beautiful hair . Combs have a long history in Japan. goes back to the Heian period. When the Saigu, or royal vestal virgin of Ise, was about to be sent away on her prolonged period of service at the Great Shrine, she was called to the palace and the emperor thrust a comb into her hair with his own hands. This was the wakare no kushi, or " comb of separation." Thus the sojourn of the virgin princess at Ise was brought under the taboo of comb and hair.
. . . CLICK here for hairpin Photos !
. Kobayashi Issa 小林一茶 . This hokku is from the second half of the twelfth month (early February) in 1825, soon after Issa had returned to his house in his hometown after several months of staying at students' houses following his second wife's declaration of divorce and a stroke that caused him to temporarily lose the power of speech. A little over a year earlier, in January 1824, the last surviving member of Issa's family, his third son Konzaburō, who was not quite two, had died, so 1824 had been a traumatic year for Issa. The boy's voice is mysterious. The butterfly and the boy seem to share some sort of intuitive animal communication. Could the hokku be based on Issa's memory of an experience with his infant third son when the boy was alive? Or is Issa perhaps watching a young boy in 1825 and remembering his own four dead children and his dead wife? According to the hokku's headnote, a young boy seems to be laughing or just making sounds, presumably of delight, as he watches a small butterfly and a woman (his mother?) who has inserted or is inserting a decorative hairstick into her hair. In Issa's time hairsticks were often metal and had two parallel prongs, making the hairstick resemble a slim tuning fork. 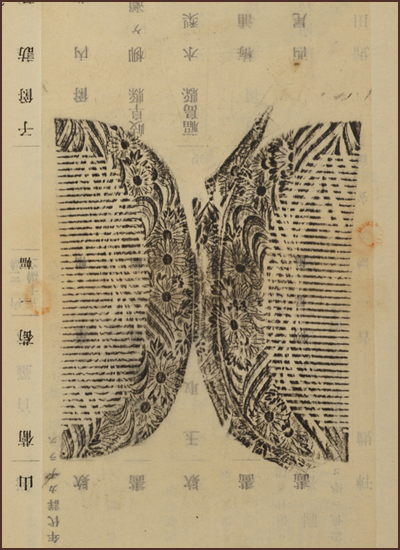 At the base, where the two prongs diverged, there was a decorative image, usually a small painting or a carved shape -- in this hokku a representation of a butterfly. The real butterfly seems to have been stimulated both by the shape on the hairstick and by the young boy's voice -- does it feel the voice vibrate through its wings? -- and at the sound of the voice it flits near the shape on the stick in the woman's hair, trying to make friends with it. Issa seems to suggest the small butterfly is inviting the butterfly shape to fly up and do a mating dance with it. 1- 裁ち For Edo Tsumami-Kanzashi (ornamental hairpins), small squares of dyed silk are accurately cut using a fabric slice, a wooden measure and a chopping board. 2- つまみ With fine-tipped tweezers, the silk squares are pinched and folded using various traditional tsumami (pinching) techniques. These techniques include the maru-tsumami 丸つまみ (the round pinch), the kaku-tsumami 角つまみ (the square pinch), the suji-tsumami じつまみ (a pinching technique for creating family crest patterns), and the uragaeshi-tsumami (the reverse pinch) 裏返しつまみ. 3- ふき（植えつけ） Fuki (placement) involves affixing the pinched small squares of silk to a pasteboard coated with rice starch. Each piece of silk is placed using tweezers and shaped to make petals, flowers and cranes, etc. 4- 組上げ The final mounting of finished ornaments to hairpins is done using kyokuten-ito (a very fine silk twine). 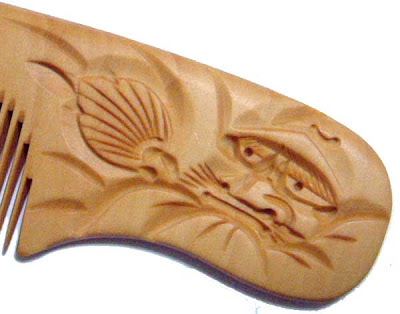 ・Timber used as base wood (for hairpins) includes boxwood, pear, magnolia, and other species with similar properties. 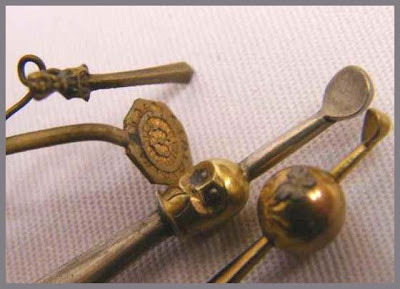 The origins of ornamental hairpins are said to lie with the tradition of "passing something through the hair." The basis of this tradition was the ancient belief that narrow rods with pointy tips held magical powers. Thus, people felt evil might be warded off if a narrow hairpin was passed through the hair. 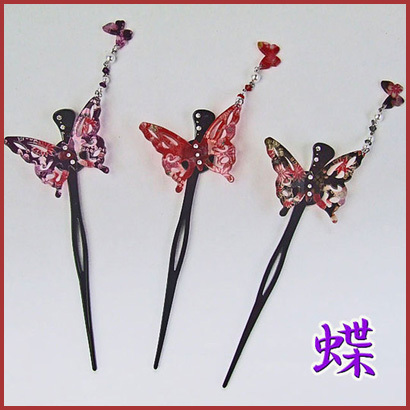 However, the ornamental hairpins of more modern times are not just derived from something “passed through the hair.” Rather, it is said the Edo tradition of Tsumami-Kanzashi (ornamental hairpins) commenced in the early Edo Period due to a particular technique for making ornamental flower petals arriving in Edo from Kyoto. With this technique, lightweight silk is cut into small squares and then shaped by tweezers using traditional pinching techniques. By arranging these pieces using a “pinch craft” process, flowers and birds are created. In the middle Edo Period, combs 櫛, ornaments 簪 and hair decorations called “kusudama”楠玉 (a ball-shaped decoration of flowers created from tsumami) were all made in the city. As these articles were beautiful in color and reasonable in price, it is said they were favored as souvenirs of Edo. 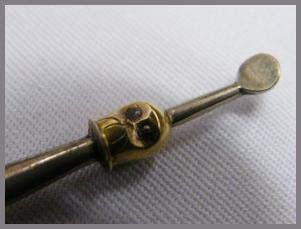 In the collection of the “Byakkotai-Kinenkan”白虎隊記念館 (The White Tiger Force Museum*) in Aizuwakamatsu City, Fukushima Prefecture; there is a tsumami kusudama ornamental hairpin believed to have been taken back to the Aizu Domain from Edo as a souvenir. 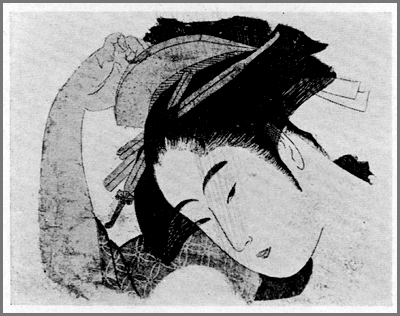 Moreover, among models featured in “fujinzu”婦人図 (depictions of women) created by woodblock print artists of the late Edo to early Meiji Periods, it appears the hair ornaments shown are in the Tsumami-Kanzashi style. 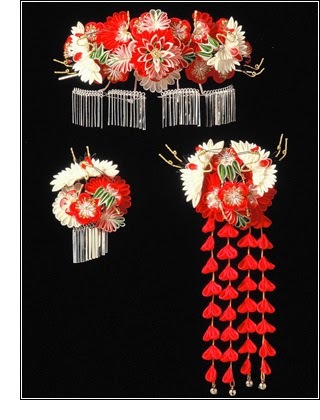 In contemporary times, Tokyo is the main manufacturing area of Tsumami-Kanzashi ornamental hairpins, these products further enhancing the beauty of the feminine form when dressed in kimono on occasions such as the New Year 正月, “shichigosan”七五三 (the seven-five-three festival), “jusanmairi”十三まいり (a temple visit made by 13-year-old children to give thanks for their traditional coming of age), “seijinshiki”成人式 (a ceremony that celebrates minors obtaining their age of majority), and weddings. * The “Byakkotai-Kinenkan” is a museum that commemorates Aizu Domain warriors of the Boshin War (1868 -1869). They begun to flourish in the middle of the Edo period.
. Traditional Crafts of Tokyo and Edo .
. Edo Shokunin - 江戸の職人 Craftsmen of Edo - . fallen leaves of boxwood . Land of origin is Australia. It grows about 40 cm and has flowers of many colors from white to pink to purple. Also good to make dry flowers of the blossoms.
. Plants in Spring - SAIJIKI . The mushroom could well be a sexual symbol.
. hatsu kami 初髪 (はつかみ) "first hair"
"hair falling out like leaves"
Boys and girls at age three are combed tn this fashion for the first time. This is a celebration of growing up for the whole family. A wig is made from white hemp or cotton and put on the head of the children, to show they will grow to ripe old age. After visiting the family deity (ujigami) there is a feast with all the relatives. Boys are next celebrated at age 5, when they put on their first hakama trousers. On an auspicious day in December, the collected hair, broken combs and cut nails of the emperor or high-ranking persons are offered at official shrines and burned in a ritual fire. It is already reported in the Tales of Genji.
. Hairstyles and hairdressers in Edo - - 髪 kami . At the temple Enkakuji 円覚寺 in Fukaura, Northern Japan, there are votive tablets (ema) with cut-off hair of samurai. When a trade ship bound south was in difficult stormy waters, they would cut off their chonmage and pray to the deities for survival. If they did, the hair was offered at this temple, and is shown to our day. is a V-shaped point in the hairline in the center of the forehead. Hair growth on the forehead is suppressed in a bilateral pair of periorbital fields. Normally, these fields join in the middle of the forehead so as to give a hairline that runs straight across. Widow's peak results when the point of intersection on the forehead of the upper perimeters of these fields is lower than usual. Fascinating read. The best information I've found when searching for Tsuge Gushi information. This haiku refers to a custom at a certain Buddhist temple in Kyoto. On the first Day of the Tiger of each year, pilgrims could purchase the temple's famous flint stones by lowering a basket with their money into a hole. Unseen monks below would then exchange the stones for the money. Shinji Ogawa notes that the hiragana symbols make should be pronounced mage: an old-fashioned Japanese hairstyle. The blossoms are falling onto someone's hair. Read the discussion . . .
Yasui Konpira-gu, Higashiyama-ku, Kyoto, September 22, 2014. The unique Festival is held every 4th Monday of September in Gion and Yasui Konpira-gu shrine. Combs and hairpins are appreciated and blessed for the way they decorate women's hair. Colorful parade of about 45 women with their hair done in various styles representing each era from ancient times to the present day, and in clothes reflecting those eras. "A woman's hair is her life"
(Kami wa onna no inochi). every month on the 18th. Katsura-Otoko (桂男): the Wig Man. It's a certain spot on the moon that, if you stare at it too long, reaches out an arm and pulls you into the spirit world. "Let's go to the Yakushi Hall and have some fun!" He went home and told his family: "I am going to the Yakushi Hall now, but first give me some water!" His daughter thought this was strange, gave him some tea and did not let him go. In such a case, it is never good to give drinking water to a bewitched person.